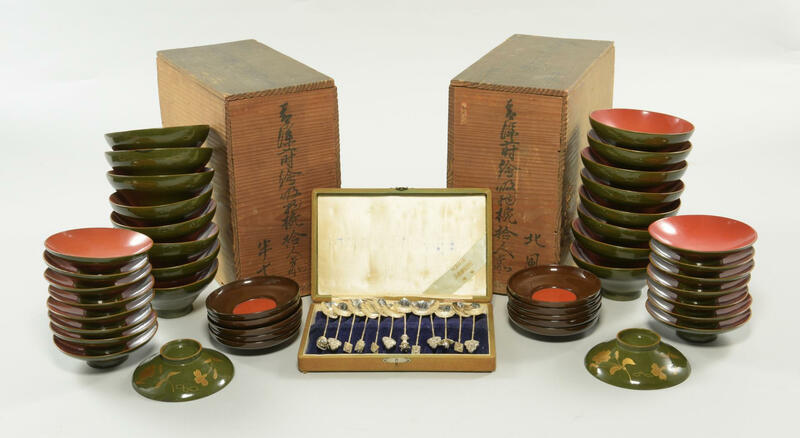 1st group: Two boxed sets of lacquer sake and tea cups, chataku (saucers) with circular shallow cups and short ring foot decorated with gold hiramaki-e, 43 total. Tea cup with olive green lacquer exterior, red lacquer interior, and gold hiramaki-e decoration – 2-1/4" H x 4-3/4" dia. Sake cup olive green lacquer exterior, red lacquer interior, and gold hiramaki-e decoration – 1-1/4" H x 4-3/8" dia. Chataku brown lacquer exterior and interior with red lacquer center – 1" H x 4-1/8" dia. Housed in custom wooden boxes with black ink Japanese character marks to lid and one side. Meiji period, late 19th-early 20th century. 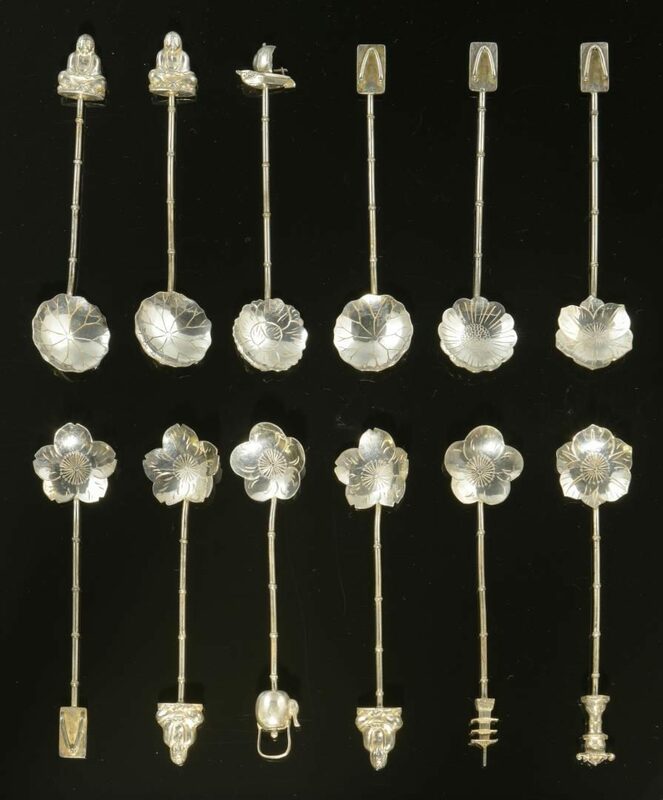 2nd group: Set of twelve Japanese silver demitasse spoons with engraved bowls and novelty figural handles including buddha, ship, tea kettle, rickshaw, bucket, etc., marked "Sterling", all in silk and blue velvet lined fitted box with "Murata" retailer tag. 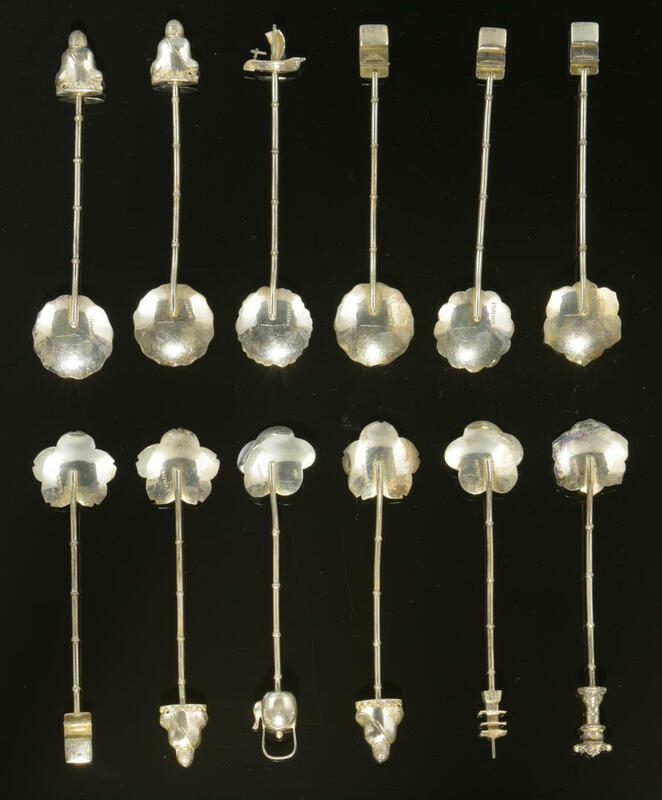 Each approximately 4" L, 2.95 oz troy total weight. Mid 20th century. CONDITION: 1st group – Cups in overall good condition. Chips to interior lacquer on five cups, largest 1-1/8" on one of the sake cups. Boxes in worn condition. One box missing 2-1/2" H x 5" W section of wood on one side. 2nd group – Overall excellent condition. Box in worn condition.